Howard G. Eicher, 101, went to be with Jesus on November 30, 2018. Howard was born January 25, 1917, to Benjamin and Violet Eicher in Flint MI. Howard was the second of three sons. He lived in Badax and Temperance, MI while growing up as well as in Alpena, MI. He graduated form Ft. Wayne Bible College and Taylor University. Howard served several churches as pastor, including Auburn, IN, Davidson, MI, Detroit, MI, Boone, IA, San Diego, CA, and Coronado, CA. 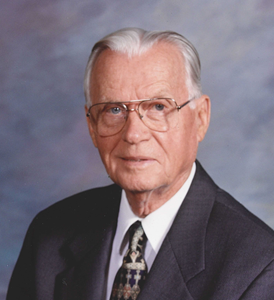 He was an active supporter of the American Baptist Convention USA throughout his professional career. Her also served on the American Baptist Church USA General Board for four years. Howard was preceded in death by his parents, his wife, Margaret, his brother, Don and sister-in-law, Mildred, his brother Harlan, and sister-in-law Florence, and his grand-daughter Kristin Gates. He is survived by his daughter Edith Gates and son-in-law, Daniel Gates, his son Eric, and daughter-in-law, Brenda, seven grandchildren: Kari Eicher, Mark Eicher, Steve Marshall, Ben Marshall, Nicole Marshall, Stephanie Gates, Elonne Pombo, and four great-grandchildren: Zechariah Pombo, Jaeden Pombo, Eliana Marshall and Harrison Marshall. Also surviving are grandchildren by marriage: Ashlee Marshall, Augie Arballo, Kim Eicher, Jim Pombo, twenty-one nieces and nephews their spouses and children. Howard lived in Clovis, CA prior to moving to Olathe in 2008, where he resided at Aberdeen Village and most recently at Wellsville Retirement Center. Memorials may be given in memory of Howard to Healing House, Inc., Recovery Community Center, 4505 St. John Ave., Kansas City, MO 64123. Private Interment in San Diego, CA. Add your memories to the guest book of Howard Eicher. Sorry for your loss. Guessing it was his time. Eric and Jill Hyer.